Last night was the 1st GOP debate for the 2016 election cycle with 10 guys up on the FOX news debate stage. I’ve got a LinkFest and Best Lines/Zingers articles up over at ConMom for those who want to see more about what went on. In general, there was not nearly enough education discussion last night, but with 10 people and a lot of topics to cover it might be understandable. However. Common Core came up. This article is all about Jeb Bush and his Common Core dodge last night. With the way the event was structured, Bush’s stalking horse, Gov. Kasich, couldn’t take the heat for him on this one. Anyone who thinks Kasich is in this race for any reason other than to hand Ohio to Bush is kidding themselves. The portion of the debate is in the transcript below via Washington Post. 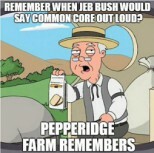 Bush refuses to say the words “COMMON CORE”. Bush didn’t answer the question. Likely, because he has openly mocked parents and citizens alongside Huckabee and Kasich on Common Core. Marco Rubio makes sure Bush doesn’t get away with it; schooling Bush in an understated but effective manner. QUESTION: Governor Bush, you are one of the few people on the stage who advocates for Common Core education standards, reading and math. A lot of people on this stage vigorously oppose federal involvement in education. They say it should all be handled locally. President Obama’s secretary of education, Arnie Duncan, has said that most of the criticism of Common Core is due to a, quote, “fringe group of critics.” Do you think that’s accurate? BUSH: No, I don’t. And I don’t believe the federal government should be involved in the creation of standards directly or indirectly, the creation of curriculum or content. It is clearly a state responsibility. I’m for higher standards… measured in an intellectually honest way, with abundant school choice, ending social promotion. And I know how to do this because as governor of the state of Florida I created the first statewide voucher program in the country, the second statewide voucher program, in the country and the third statewide voucher program in the country. And we had rising student achievement across the board, because high standards, robust accountability, ending social promotion in third grade, real school choice across the board, challenging the teachers union and beating them is the way to go. And Florida’s low income kids had the greatest gains inside the country. Our graduation rate improved by 50 percent. That’s what I’m for. BAIER: Senator Rubio, why is Governor Bush wrong on Common Core? RUBIO: Well, first off, I too believe in curriculum reform. It is critically important in the 21st Century. We do need curriculum reform. And it should happen at the state and local level. That is where educational policy belongs, because if a parent is unhappy with what their child is being taught in school, they can go to that local school board or their state legislature, or their governor and get it changed. This entry was posted in Common Core, ELECTIONS, LL1885, The Articles and tagged Common Core, Election 2016, FOX GOP DEBATE, Governor John Kasich, Jeb Bush. Bookmark the permalink.